After a roster of campaign stars that include Kate Moss, Vincent Gallo, Lennon Gallagher, and OG YSL muse Betty Catroux, Saint Laurent has enlisted Travis Scott to front its SS19 menswear campaign. 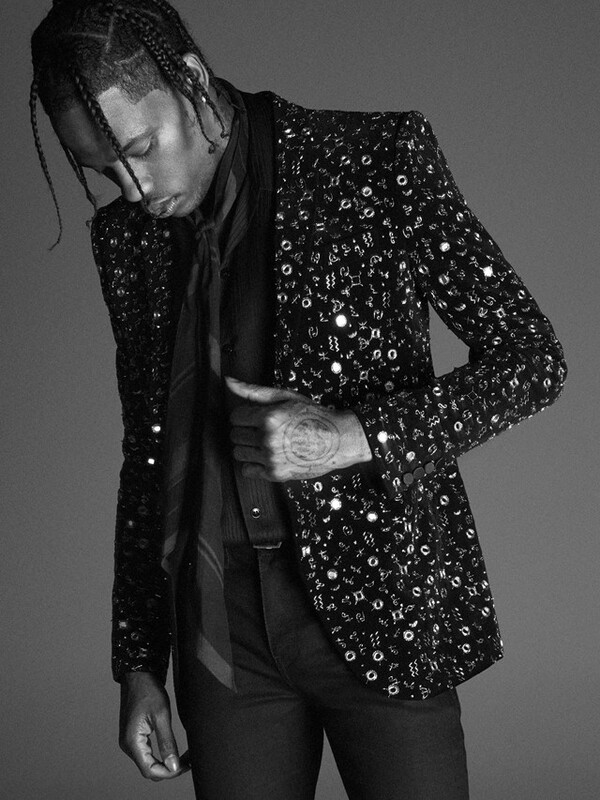 Shot by longterm collaborator David Sims, the images are in the house’s signature black-and-white and feature the rapper in an embellished black blazer. Elsewhere, he appears in a military-style jacket. This isn’t Scott’s first campaign for Saint Laurent, previously appearing in a short film soon after Anthony Vaccarello presented his debut collection. To accompany the images, there is also a short campaign video that sees posing while Iggy Pop’s “The Passenger” plays. With Saint Laurent’s campaign images released throughout the year, you likely won’t have long to wait until the next one debuts. The next collection though sadly won’t be revealed until next year during PFW’s AW19 shows.